It had been a long productive day chasing brown trout for my friend Bob and I. We were sitting in his office-library-fly tying room soothing our sore arms and reminiscing over past adventures. I had prescribed a dose of twelve year old, single malt as pain medication. Time passed and as we talked, I noticed part of a poster that said “World’s Greatest….” hiding behind a stack of books and papers, reached over and pulled out the poster shown above. “There has got to be a story behind this” I said, exposing the full poster to view. “Cough it up Bob” I said (noticing that time had lowered the level of medication in our glasses) “but not before I refill our glasses because this sounds like it could be thirsty work”. Now Bob is the type of person that enjoys telling a story. He also has the experience to back it up. He can take a two-line joke and stretch it into a 10-minute tale. I have been the victim of a number of these tales and always find myself sucked into the inevitable punch line hook, line and sinker (pun intended). He once extended a trout story out so long that I forgot where we started and had caught two fish before the end. I returned with a fresh beverage, got comfortable in the chair, held up the poster and he began. “At the invitation of a friend of mine, four of us flew out of Red Wing into Canada on a week long trip to an old Hudson’s Bay trading post that he had bought. The plane left us at this rustic lake location and we were on our own for the week. All of us were fly fishermen so we had our gear and also had regular tackle available. Meals in the evening were walleye that one of us could easily catch. We spent a lot of time trying to catch northern pike on flies and, after two days things were not working out too well. Let me tell you that, after a while, spam started to look good as a walleye alternative. There is such a thing as too much walleye, too much spam and not enough scotch”. Bob looked at the poster as if contemplating his next words while I anticipated the continuation of the story. I must interrupt here and point out that Bob is a very good fly tier. His flies are an example of the through study of a pattern. This study is then translated into an end product reflecting a simplicity and economy of tying skills that I wish I could match. 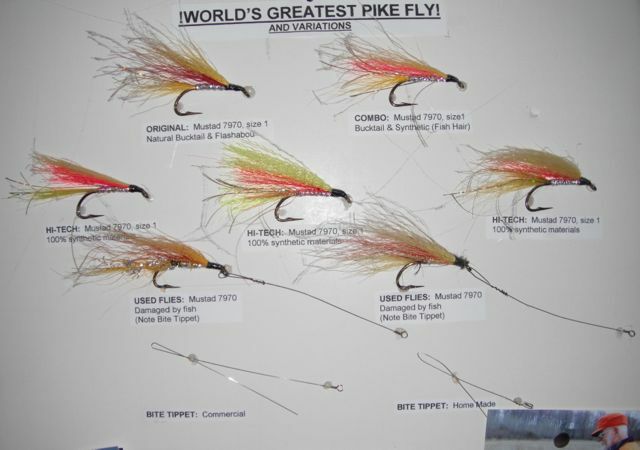 He may never have tried to win awards for his tying ability but his customers and the trout both seemed to really go for it. (In the photo above, the original is top left and the variations and damaged flies are described) The story continued. “Bob” I said, “ how come your version of the fly was effective and similar flies were not”. He swirled his scotch in his glass, contemplating the amber liquid or maybe looking for inspiration and then continued. I stared at the poster for a minute and said. October 25, 2013 in Fly fishing tales.